The video really says it all, and tells officers even more. The first officer, Officer Ricky Grissom, was obviously irritated – note how he hangs up the phone on the prisoner, Keyarika “Shea” Diggles. According to several sources, Diggles’s bond or fine was $100.00, which means that this was the equivalent of a ticket for Disorderly Conduct. At 0:50 in the video (first camera angle) and again at 3:28 (second angle) you see Grissom go hands on. Texas law allows a person to defend oneself from an officer’s unprovoked and unnecessary use of force. Tex. Pen. Code Ann. § 9.31; see also Bowen v. State, 162 S.W.3d 226 (Tex. Crim. App. 2005). When Diggles lifted her hand to protect herself, the second officer, Officer Ryan Cunningham, slams her head into the counter, and then, with a handful of hair, takes her to the floor. Former Officers Ricky Grissom and Ryan Cunningham. Aside from the impropriety of dragging her by her foot, I would also bring your attention to 1:50 in the video where the officer brings the woman’s shackled arms directly up in the air. This causes extreme pain and does not serve any legitimate law enforcement purpose. It can also cause serious injury to shoulders. It appears to be a case of the officers inflicting their own punishment on the woman. There are any number of reasons that this happened–unfortunately, none of them are valid reasons. Hopefully, the Jasper County District Attorney will look at criminal charges against the officers, starting with Assault with Bodily Injury and Official Oppression. He’s already dropped the bogus Resisting Arrest charge that the officers filed on Diggles. The officers were fired on Monday, June 3, 2013, but only after a city council member sent the video to the local media, since the police department was ignoring Diggles written complaint. The mayor Mike Lout (yeah, that’s his real name, I couldn’t make this stuff up) was semi-defensive of the officers, saying “She refused to do what the officers told her to do and she resisted.” Other council members did not agree and voted to fire the officers. 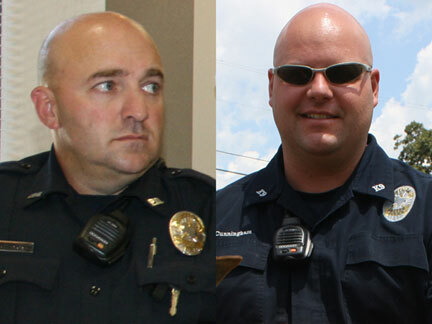 As a side-note and completely biased on my part, why is it that the officers that shave their head seem to be more aggressive? Both officers tried to contact Diggles by phone after she filed the written complaint. A local TV station has photos of the caller ID from the phone calls. What purpose would this serve, other than to threaten or intimidate the witness?